Spread about 2 teaspoons peanut butter over the crackers. Put 8 pretzels into peanut butter, each side to make the legs. 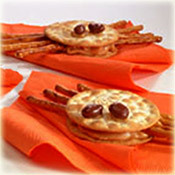 The top of the spider needs to be made with the remaining crackers. After you have made the top, slightly press the top of cracker sandwiches with 2 peanut butter dots. Place 1 Raisinet on each dot to make the eyes. Take 2 packages of cream cheese, the taco-flavored cheese, and margarine in bowl and mix it. Leave it for 30min. Add milk to the cheese mixture. Beat with an electric mixer until combined.stop occasionally to scrape the bowl with a rubber spatula.cover the bowl. Chill it for 4 to 24hrs. Place on a serving plate. Form cheese mixture into a head shape. Stir the remaining cream cheese until smooth in a bowl. 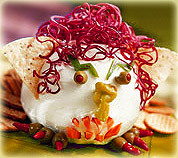 Spread head with softened cream cheese. Add tortilla chips for ears.Using wooden toothpicks for support. 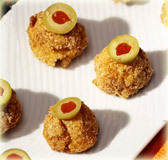 Add a pickled whole pepper for nose,add pimiento-stuffed olives for eyes,last add pepper-stuffed olives for toes. Cut it into zigzag style. Add shredded beets for hair and add carrot sticks for teeth.serve it. Prepare macaroni and cheese as per package instruction. Chill it for 30 min in refrigerator. Preheat oven. Grease baking sheet lightly and spread nonstick cooking spray. Take a shallow dish and combine bread crumbs and bouillon. Shape macaroni and cheese into 1½-inch balls and cover it properly with prepared bread crumbs. Serve the balls on prepared baking sheet. Press one olive slice on center of each ball. Bake it for 15 to 20 min.